This titanium flash SUV has an automatic transmission and is powered by a 187HP 2.5L 4 Cylinder Engine. Our CX-5's trim level is GS. This GS CX-5 adds synthetic leather and suede seats, heated steering wheel, power liftgate, eco friendly drivetrain upgrades, auto leveling headlamps, remote folding rear seats, and a colour multi-information display to make everything more comfortable while a driver assistance suite complete with stop and go adaptive cruise, full range active braking assist, pedestrian detection, forward obstruction warning, lane keep assist with departure warning, and high beam control help make every drive more safe and less fatiguing. For even more comfort, you get heated front seats, advanced blind spot monitoring, 7 inch Mazda Connect enabled touchscreen, Apple CarPlay, Android Auto, USB and aux jacks, texting assistant, and internet radio capability. Other features include keyless entry, aluminum wheels, power heated side mirrors with turn signals, rain sensing wipers, multifunction steering wheel, and a wide angle rearview camera. 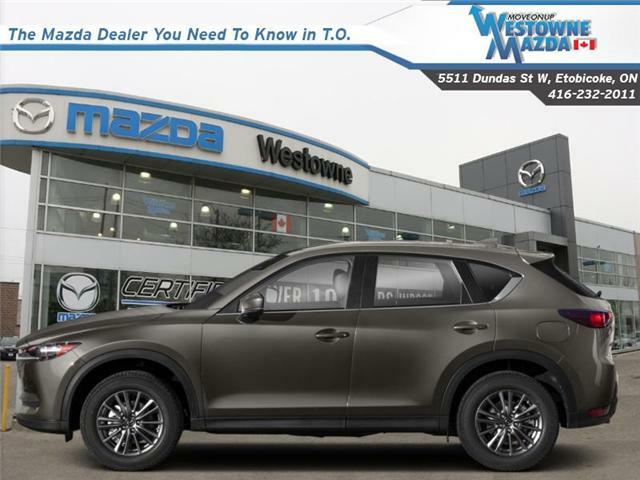 This vehicle has been upgraded with the following features: Heated Seats, Rear View Camera, Heated Steering Wheel, Bluetooth, Blind Spot Detection, Mazda Connect, Aluminum Wheels.